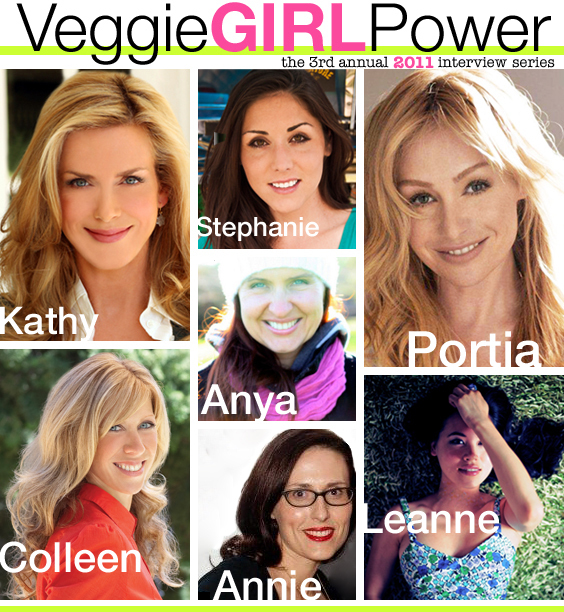 2011 Veggie Girl Power Series! This year's ladies.. 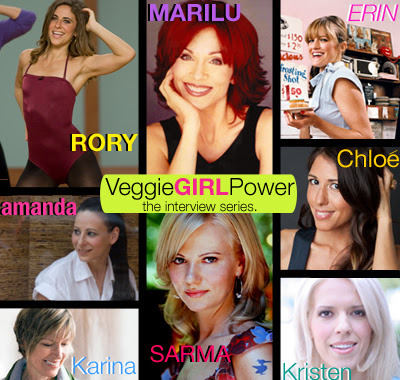 I'm super excited to kick off my third annual, 2011 Veggie Girl Power Series, my series of interviews featuring vegan ladies who inspire us. Today I'm announcing this year's seven fabulous VGP ladies. Over the next two weeks I'll be scattering their interviews here on my blog. * Colleen: A beloved speaker, author and chef - Colleen is an inspiring voice in the vegan world. She is an award-winning author of five books, including the bestselling The Joy of Vegan Baking, The Vegan Table, Color Me Vegan, and Vegan’s Daily Companion. Her latest book, The 30-Day Vegan Challenge, came out this past August. Colleen's website is Compassionate Cooks. * Leanne: If you are a vegan fashionista, you surely know about Leanne's fabulous fashion line Vaute Couture. Every item is 100% vegan. Totally gorgeous. From fall coats to adorable bunny tanks. Love it all. * Stephanie: As a fan of Food Trucks and reality TV, I was thrilled to watch Stephanie and her SeaBirds ladies compete in the latest season of Food Network's The Great Food Truck Race. Stephanie, aka "Mama Bird" is the owner/founder of SeaBirds. Her truck's 100% plant-based menu serves up amazing vegan eats to the lucky residents of Orange County, California. * Anya: Golubka means "dove" in Russian, Anya's native language. Anya's raw, vegan food blog, G0lubka is filled with awe-inspiring photography, uber-creative recipes and things that simply make you go, "WOW!" I am thrilled to get to know Anya. * Kathy: Kathy Freston is a New York Times best-selling author. Her latest book is simply called Veganist. Kathy was also a featured guest on last year's famous "vegan challenge Oprah show." Kathy has appeared on a wide number of mainstream shows - inspiring the world to give vegan a try. * Portia: Portia is well-known as being a talented Hollywood actress. But Portia is also well known for her passionate love of animals. She was recently featured on the July+August 2011 cover of VegNews Magazine. Portia and her wife Ellen DeGeneres are an inspiring dynamic duo - bringing the conversation of "vegan" to a very mainstream audience. I'm simply giddy to feature Portia this year! What is Veggie Girl Power? This series celebrates female trailblazers who inspire us! These veg-superstars are women with experience, wisdom, creativity, skills, heart, passion, grace, drive, dedication and personality.